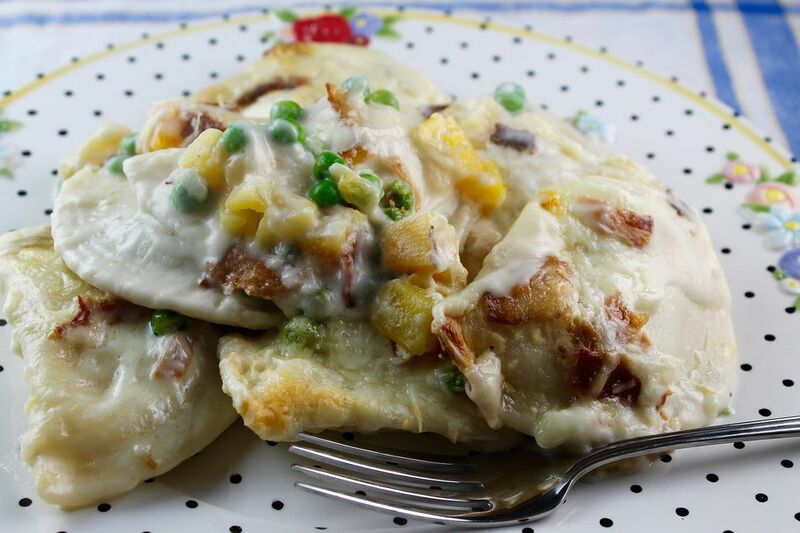 Pierogies are big wonderful pasta half moons that are stuffed with potatoes and cheese. You can make them yourself, or better yet, buy them frozen in the grocery store. They are used to make this fabulous Creamy Pierogie and Squash Casserole that is rich and flavorful and tastes like fall. You can omit the bacon in this recipe to make it a vegetarian dish. But if you aren't vegetarian, the bacon adds such a smoky and wonderful porky flavor that it would be a shame to omit it. This recipe is the simplest kind of all - a one pan dinner. You just layer all of the ingredients in a pan and bake it. That's it. Serve this one dish meal with a green salad tossed with mushrooms and avocados, or with a nice fruit salad. With a glass of wine, that's all you need for a wonderful and easy dinner. Now put your feet up. Preheat the oven to 375°F. Spray a 9" x 13" casserole dish with nonstick cooking spray. Don't skip this step, as this casserole has a tendency to stick. Put about 2/3 cup of the Alfredo sauce into the bottom of the prepared casserole dish. Top with one of the packages of the frozen pierogies; don't thaw them. Then top with half of the frozen butternut squash and half of the bacon and peas. Sprinkle with half of the Swiss, Havarti, and Gouda cheeses. Top with the rest of the first bottle of Alfredo sauce. Then pour half of the cream into the bottle. Screw on the lid and shake well, then pour this mixture into the casserole. This is how you get all of the sauce out of the bottle. Top the casserole with the remaining pierogies, remaining squash, bacon, peas, Swiss, Havarti, and Gouda. Pour the second bottle of remaining Alfredo sauce. Then repeat the process with the cream, pouring it into the bottle. Drizzle this over the food in the casserole, making sure you cover every bit of food. Sprinkle the whole thing with the Parmesan cheese and cover with foil. Bake for 45 minutes, then remove the foil. Bake for another 15-20 minutes or until the casserole is bubbly and the cheese on the top is melted and beginning to brown. Serve immediately.